Companies today collect more data than they have ever collected in the past. 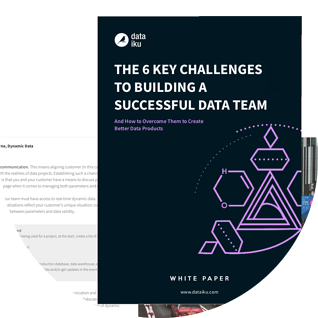 This white paper discusses the challenges teams face in converting this data into meaningful business insights. What Makes a Great Data Team? When data teams are well-organized and structured to succeed, the insights they can bring to companies are far reaching and significant. The challenges that these team often face in getting to that point, however, can often be significant. Predicting when these problems might arise and investing energy in doing things right from the start has the capacity to greatly improve the efficiency of any company. This white paper offers solutions to some of the most common headaches. Six possible challenges that any company interested in pursuing data-oriented strategies should keep in mind prior to creating their data teams. An overview of some solutions and plans-of-action that will allow companies to combat these challenges.